Eighty percent of the workforce at Blue Cross & Blue Shield of Rhode Island (BCBSRI) lives in Rhode Island, where our private, nonprofit organization serves about 400,000 members in a state of one million. The company has been an integral part of the state’s business landscape since 1939. I returned to Rhode Island – where I grew up and lived the first 18 years of my life – about a year and a half ago for the wonderful opportunity to lead BCBSRI. Rhode Island is a one-of-a-kind state. We’re innovative and futuristic with a small town feel. Our size and geography make for easy connections. And opportunities naturally abound for collaborating with stakeholders—from elected officials to physicians to customers—around our company’s mission to make healthcare affordable and simple. When I got the call to consider taking the BCBSRI job and move back to Rhode Island, I thought about the business opportunities here, about the state’s talented workforce and its tax incentives, and about the close-knit nature of this state. People work collaboratively and rely on each other to get things done. And it’s so small that it seems everyone is connected by only a few degrees of separation: After 30 years of living away from the state, I came back to meet the attorney general here, only to learn he was living in the house where my father grew up. Rhode Island is also very beautiful. Recently, I was on a bike trip in Nova Scotia, which is well known for its beauty, but I kept thinking about Rhode Island, where it is so easy to access our 400 miles of coastline and fabulous beaches – not to mention our own very respectable bike paths. Our cities feature amazingly well preserved architectural gems that tell the story of our proud history as a state that treasures freedom and independence. As for Rhode Island’s small size, I’ve found it to be nothing but an advantage in the business world. Not only is it easier to become a thought leader here, but also the state punches well above its weight with a talented workforce that’s constantly refreshed by the creative thinkers and entrepreneurs pouring out of our 11 colleges and universities. BCBSRI has connections with many of these universities, not only sourcing some of our interns and full-time employees from them but partnering with medical schools and schools of public health on research and development projects. We’ve worked with graduate students to help us understand everything from trends in healthcare, to how to use data and analytics to create better products and services for our customers. I’ve been in health insurance and healthcare for 30 years, and there’s never been a more dynamic time to be in this industry or to be in business in Rhode Island. As the most hyperlocal sector that exists, healthcare and its players thrive when we are locally rooted among the people we serve. We are able to understand the culture, the economy, the customers and the talent, how providers are delivering services and how relationships in the market work. Healthcare is unfortunately more complicated than any of us would like it to be, and that means sometimes people just want to speak to a real person when they have a question. That’s why BCBSRI has three retail stores and has gone to great lengths to make Rhode Islanders of every age and from every background – including those for whom English is not their first language – feel at home in those stores. 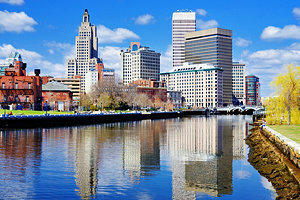 Ultimately, Rhode Island’s size advantage is not specific to the healthcare business; it’s a bonus across industries where it’s important to understand your customers and stakeholders. There’s no better way to do that than to live next door to them. Or better yet, to roll up your sleeves and volunteer among them and for them. Our employees especially love our company day of service, Blue across Rhode Island, when we fan out across the state and spend time doing things like putting up playgrounds, painting homeless shelters, planting gardens, and refurbishing children’s camps – all to assist our most under-resourced communities. We value all the relationships we’ve built in Rhode Island. One of our most important partnerships is with the Greater Providence Chamber of Commerce. We’ve worked with the Chamber on a number of economic development initiatives around affordable healthcare. We see the Chamber bringing new talent, new startups, new thinking, and new perspectives to the state. The Chamber is part of Rhode Island’s rising tide, and we want to see all of those boats lift as well. Kim Keck sits on the board of directors for the Greater Providence Chamber of Commerce and is president and CEO of Blue Cross & Blue Shield of Rhode Island.